I like to change the appearance of my android device and a launcher is one of the most effective ways. This launcher is completely different from the rest. CLI launcher is black with white and green letters, no icons just text, just like a terminal. What I liked about this launcher is that firstly reminds of a terminal but also it has a really good approach to launch an app. 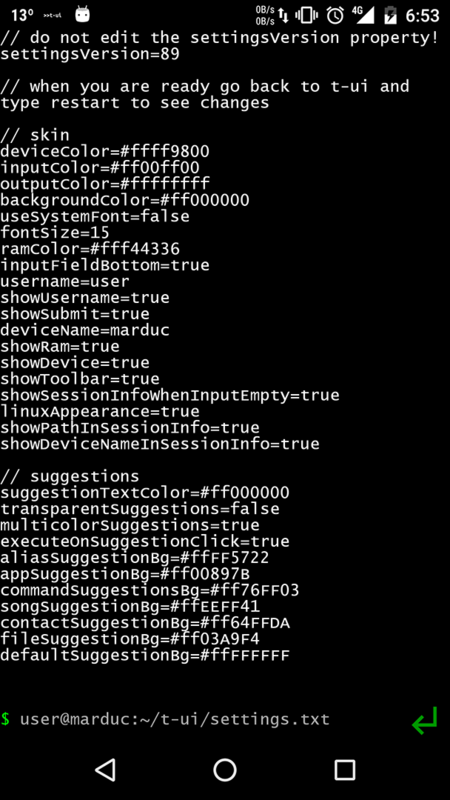 There are boxes below the terminal screen, with different colors depending of the kind of service you require (if it is an app or if it is a command). You can use the command clear to clean the history of the searches, but in case you click the back arrow it will reveal the previous search. If you want to completely clean the searches you have to use the restart command, that will restart the launcher. An other thing that I will about this launcher is the settings. You can type tuisettings and you get a text field with all the configuration settings there. There are simple boolean variables and some color configuration with hex numbers, really easy to configure. The shell commands you can execute are really limited and I hope for a better support in the future(in the meantime I use and emulator). One disadvantage of this launcher is that is slow and I don’t mean performance-slow but it takes some time to run a command to launch an application instead of the traditional click. I have this as a main launcher for at least a week and I’m pretty satisfied and you should give it a shoot if you are a terminal guy.